This set does not state what era these figures are supposed to be from. However from the look of them we would assume they are World War II, and will proceed accordingly. In 1941 the Soviet Red Army Air Force was the largest in the World. Yet it had suffered along with the rest of the Red Army at the hands of Stalin and his many purges during the 1930's. In addition to the murder of many officers, its equipment and training were well behind that of other European countries, and it made a very poor showing in the war with Finland in 1940. As a result of lessons learnt from that conflict a programme of reforms was begun, but when Germany invaded the USSR in 1941 those reforms were far from complete. After initial disasters the training was improved and better planes were manufactured in large numbers, ultimately giving the Air Force control of the skies in the final battles of the War. Though described as pilots there are also a number of ground crew here. They wear a variety of uniforms, many of which would be appropriate for any air force of the time, but some items are distinctly Soviet such as the shirt and the pilotka cap. 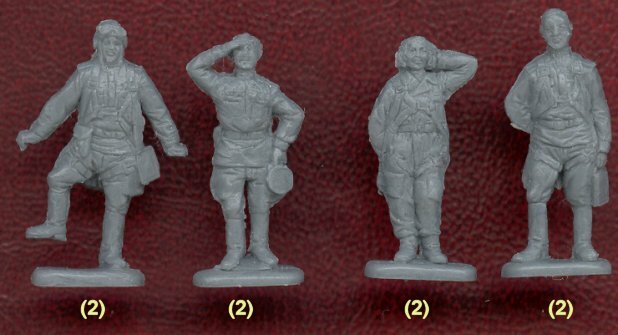 Another feature that marks these figures out as Soviet is the inclusion of female figures. Women fought in all branches of the Red Army, and several all-women regiments of fighter pilots were formed, seeing action throughout the campaign to Berlin. The woman out of flying gear is displaying a number of decorations on her shirt, which is a nice touch. 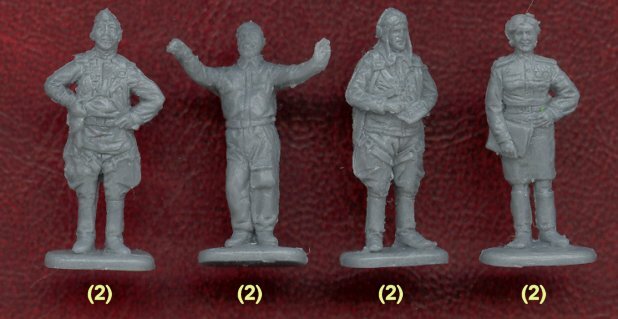 There is always something of a problem with poses of air crew, since when in action they are mostly sitting down. Most of the figures here are just standing, when it would have been nice to see some at least walking or running. The ground crew do seem to be working on something, but apart from that very little seems to be happening. The pilot with his right leg in the air is a pose we could not explain; perhaps he is meant to be nonchalantly stepping on the first rung of a ladder or something, but because his foot is directly to his side the pose looks bad. There is a lot of detail on these figures, though it is quite shallow. One or two are also noticeably flat - the female pilot has a head twice as wide as it is deep! However in general the anatomy is pretty good and the folds in the clothing are realistic. 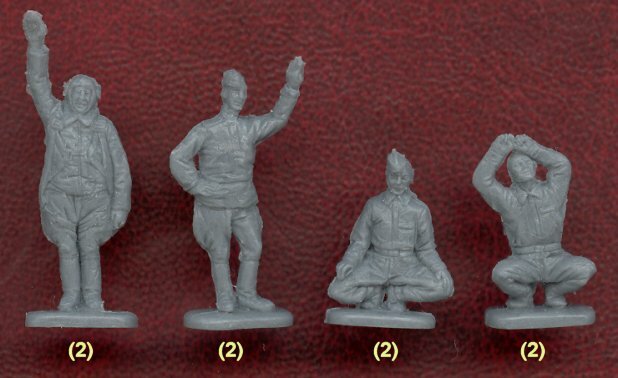 This is a fair set for a subject that has not been covered elsewhere so far, however some small problems with sculpting plus the rather dull selection of poses detract from the overall look. This set was first released by Converter1/Converter2.